Why Do People Live In Twister-Prone Oklahoma? : The Two-Way In response to our coverage of the tornadoes, online comments have asked, "Why put yourself in the path of such disaster?" But Oklahoma residents have their reasons for staying put. Why Do People Live In Twister-Prone Oklahoma? 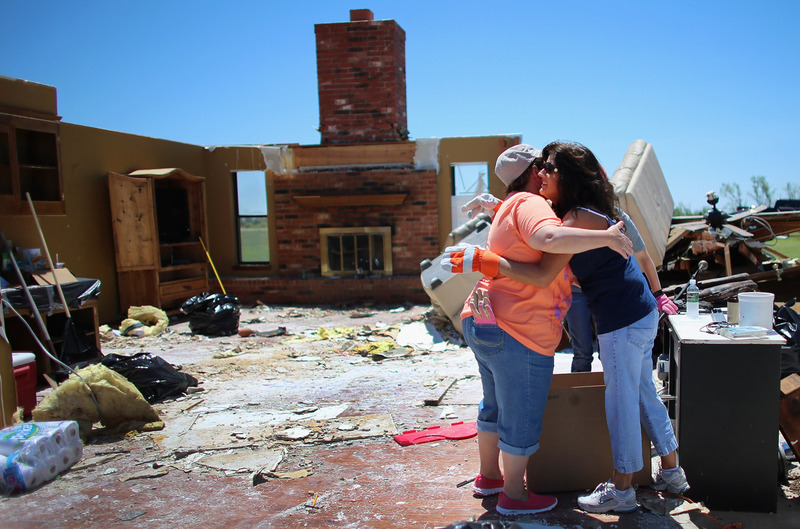 Tammy Wade (left) is hugged by Dana Givens in what is left of her home in El Reno, Okla., on Sunday, after it was destroyed by a tornado. In covering the devastating tornadoes in Oklahoma, we've been asking a lot of questions about safety and preparedness. On Saturday, a meteorologist told NPR's Wade Goodwyn that "there is no universal, one-size-fits-all guidance or safety rules for tornadoes." Some of the online commenters on that story had advice of their own, such as: "Don't live in Oklahoma." But Sooner State residents are talking back. "As devastating as the destruction was, seeing dozens of my fellow Oklahomans in plain clothes standing on top of debris digging out perfect strangers gave good feelings a chance to compete with the understandably bad ones. "That's why Oklahomans live here (outside of the awesome cost of living): We pull together." "In the midst of unthinkable devastation and loss, after we turn to our God in prayer, we can turn to our neighbors and think, 'You're doin' fine, Oklahoma.' "
BuzzFeed posted a list of the "45 Best Things About Living In Oklahoma," including: food, sports and its proclivity toward helping the little guys. 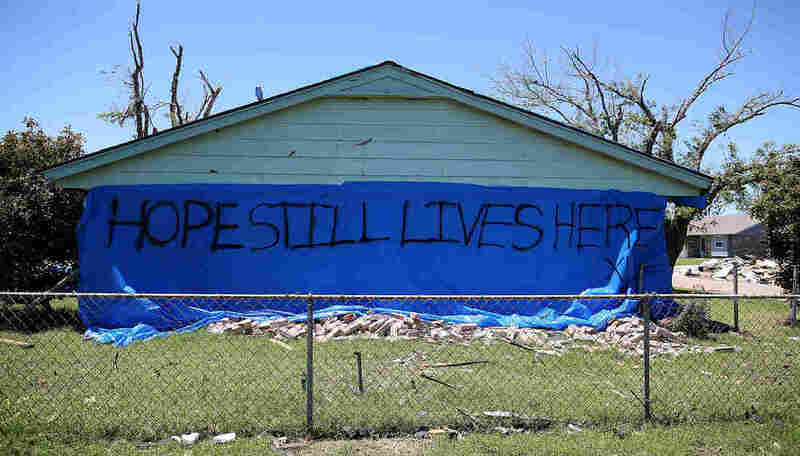 In the NPR.org comments, Aleta Boddy, who lives in Tulsa, says: "Is a tornado a good enough reason for me to abandon this home that I've come to love? Certainly not. Fear of disaster should inform good decisions, certainly, but it shouldn't control your life until you have nothing left but fear." Other commenters note that disaster can strike anywhere. Moobru points to a New York Times interactive from 2011 that maps the risk of natural disaster nationwide. (Lowest risk was in Corvallis, Ore., and the highest risk was in Dallas-Plano-Irving, Texas.) Of course, the entire discussion — serious or not — presumes that picking up stakes and moving away is even possible. Keep the (constructive) comments coming: Why do you live where you live?